The SportTrainer 700 m and 1200 m from SportDog excels in all environments and is especially suited to upland and multi-dog hunting situations. 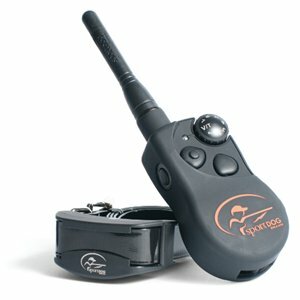 The palm-of-the-hand sized models is designed for field training and hunting with close-working dogs and features waterproof/submersible technology for both the remote transmitter and receiver collar. The remote training collar offers up to 7 levels of continuous and momentary static stimulation. Vibration and tone-only stimulation options are instantly available in every mode of operation. With Sportdog Add-A-Dog Extra Receiver Collars, the system can easily be expanded to control 3 dogs, even without losing the vibration and tone stimulation options for each dog. Low battery indication and a 2 hour recharge time for both the transmitter and receiver means the SportTrainer system is always ready for a training session or hunt.